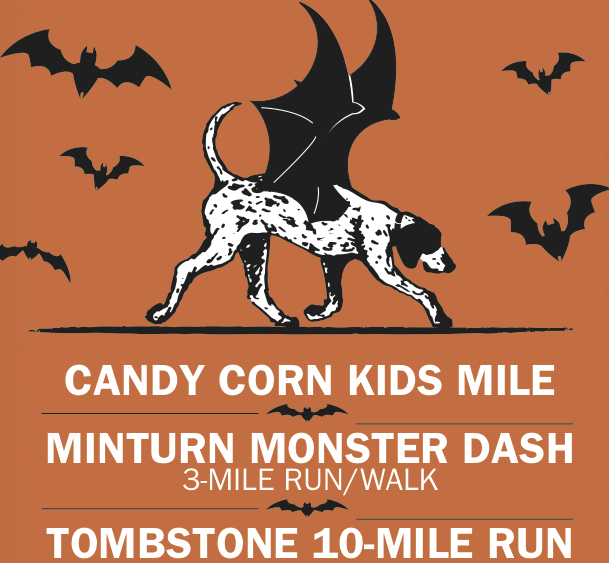 The 2nd annual MINTURN MONSTER DASH is a three mile road run in the quaint, historic town of Minturn, CO and includes a family fun run: the Candy Corn Kids Mile. New this year is the flat and fast (for the mountains) Tombstone Ten Mile. All races start and finish in the town of Minturn at The Saloon restaurant beside the bridge. The course is on paved & dirt road (+ bike path) and winds through Minturn streets/neighborhoods as well as along the Eagle River. Packet pick up and race day registration at The Saloon on Sunday morning beginning at 8:30 AM. The Minturn Monster Dash (3M) and Tombstone 10 Mile start at 10:00 AM. The Candy Corn Kids Mile starts at 10:15 AM. Come in costume! There will be prizes for best costumes in several categories (youngest, scariest, fastest, etc.) so dress for Halloween. Top finisher awards only; no age group awards. Each runner however will receive a tech t-shirt and finisher medal. Fruit, apple cider, and cupcakes at the finish! Lunch specials in-town for racers so patronize Minturn's downtown restaurants, cafes, bakeries and enjoy the Halloween decorations and festive atmosphere. NOTE: All fitness levels welcome. Young children must be accompanied by an adult. Dogs are welcome on the 3 mile course, but must be leashed. Onsite Registration Available; Note registration price increases for race day sign-up.